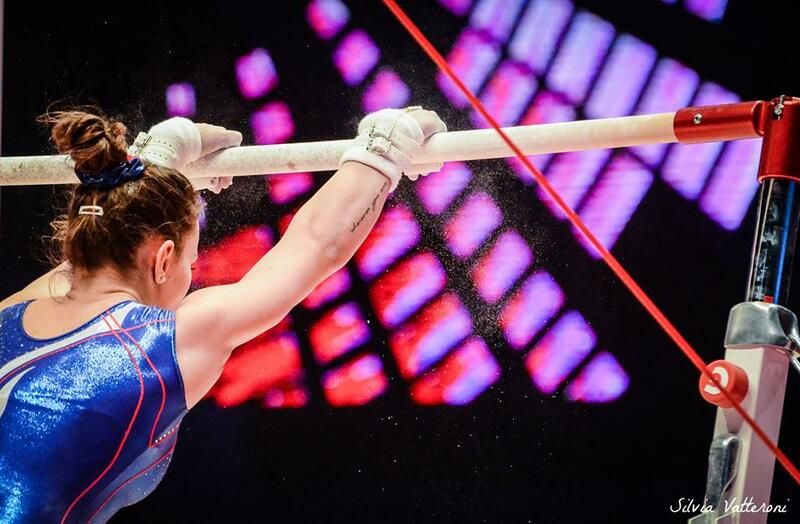 Articles by "WC Glasgow 2015"
After taking almost a year off due to injuries, Romania's Larisa Iordache had her first and only 2015 major international competition in Glasgow. So how did she do? After the London Olympics, Russia's Viktoria Komova suffered from a series of injuries and illness which put her career on hold for three years. Glasgow was her first World championships in four years. So how did she do in Glasgow! At Qualifications, she competed on vault, bars and balance beam. Komova had two of the four falls, the Russian had in team final. As a result of these falls, the team lost the bronze medal. She had this priceless reaction when she learned that she is not the only one who placed first. US Simone Biles has successfully defended her balance beam and floor exercise World titles today in Glasgow. Biles, who now has fourteen World championships medal - ten of which are gold, has broken Shannon Miller's World record in Glasgow and became the most decorated female or male US gymnast in World championships history. With fourteen World medals, she is the third most decorated gymnast at World championships. By winning her tenth gold medal today, she has the most gold medals of any female gymnast at World championships beating Russia's Svetlana Khorkina and Romania's Gina Gogean who have nine World medals in their record. Biles won beam with score 15.358 while she won floor with score 15.800. Dutch Sanne Wevers won the silver medal on beam by 14.333. This was the first medal for women's Dutch gymnastics at World championships since Suzanne Harmes in 2005. The bronze medal went to Pauline Schafer of Germany with score 14.133. The last time a female German gymnast won a medal at World championships was in 2011 by Oksana Chusovitina on vault. European floor champion Ksenia Afanasyeva of Russia won silver on floor while Biles' teammate Maggie Nichols settled for the bronze. Today at the uneven bars event final in Glasgow, four gymnasts received the same exact score thus tying for the gold medal. The gymnasts are Fan Yilin of China, Viktoria Komova and Daria Spiridonova of Russia, and Madison Kocian of USA. All four gymnasts scored 15.366. It is worth mentioning that the tie breaking rule is only applied at the Olympic games. This is the first time for four gymnasts to tie for gold at a major international competition. Nevertheless, at 1990 and 1996 European championships three gymnasts tied for gold on the same event. This was the first World individual gold medal for China's Fan Yilin, Russia's Daria Spiridonova and US Madison Kocian, while it was the second one for Russia's Viktoria Komova who previously won gold on the bars at Worlds four years ago. US Gabby Douglas and China's Chang Shunsong finished in 5th and 6th place respectively. Great Britain Ruby Harrold placed in 7th place while Germany's Sophie Scheder finished last. 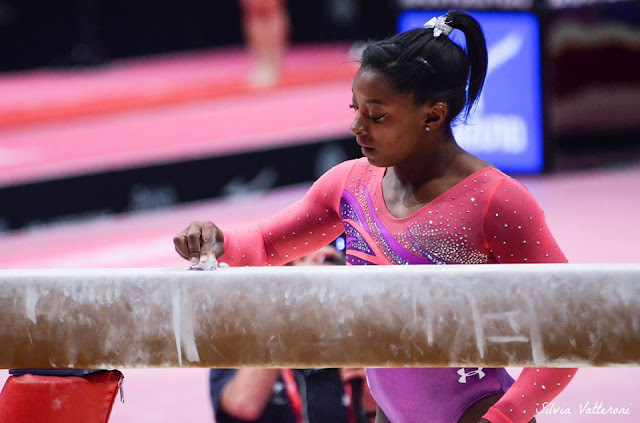 No falls occurred during the uneven bars final. Olympic vault bronze medalist Maria Paseka, who is having her first World championships experience, won gold medal by competing Amanar and Cheng, two of the most difficult vaults in women's gymnastics. Paseka is the first Russian gymnast to win a World gold medal on vault since Elena Zamoloditchkova in 2002. The silver medal went to 2014 World vault champion and North Korea's Hong Un Jong who competed the same two vaults as Paseka. Three time World all around champion Simone Biles who took silver on the event at last year's Worlds, settled for bronze. Great Britain's Ellie Downie who performed two of the easiest vaults at the competition, finished in impressive fourth place. India's Dipa Karmakar placed 5th and China's Wang Yan placed 6th. Swiss Giulia Steingruber suffered an injury after falling on her second vault. No official reports has been released regarding her state of injury. Mexico's Alex Moreno Medina finished in last place. 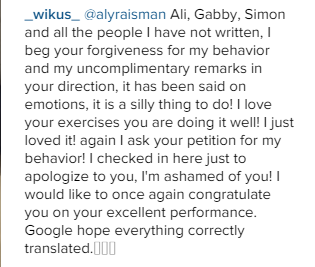 US Aly Raisman has responded to Russia's Viktoria Komova's second heartfelt apology. "❤️ All the girls appreciate your apology and we wish you the best in finals tomorrow" wrote Raisman. According to Aimee Boorman, Simone Biles' coach, the Russian gymnast gave a personal apology to the American gymnasts during training. Viktoria Komova issued two apologies after sparking fury after team finals in Glasgow when she accused the American gymnasts of taking steroids and that Great Britain and China only won because of luck. 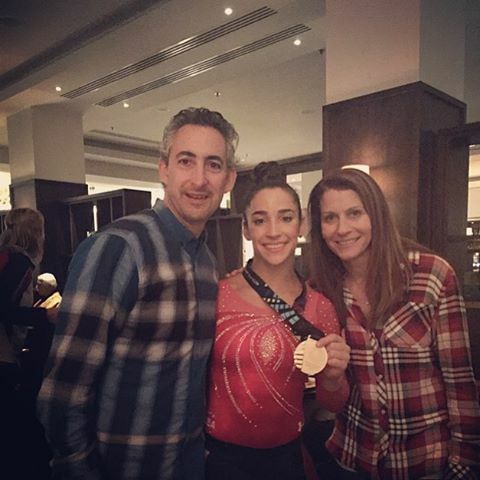 Her first apology took place on VK immediately after receiving backlash following her infamous comment, while she posted her second apology on Aly Raisman's Instagram. Russia's Viktoria Komova received backlash when she accused the American gymnasts of taking steroids and claimed that China and Great Britain only won due to luck at 2015 World championships. Komova released two apologizes. The first was on VK in the same thread where she made the accusation while the second was in a comment on Aly Raisman's Instagram account. The second apology was considered sincere and restorative by gymnastics fans. Golden-china-goes-abroad Why does Vika (and Carlotta) get eaten alive and need to apoligise a thousand times and even then people will still dislike them over a comment, while comments like the one Sam Oldham made, or Marta, Nastia, Aly, Jo etc go freely? Vkyam1 They act like Vika was the worst human ever. However, when Maroney did ugly faces IN FRONT OF EVERYONE AT THE MEDAL CEREMONY nobody said anything and they even said it was funny. And this guy Sam Oldham´s tweet saying "Surely this Chinese kid ain’t 19" about Shang Chunsong but no one is saying anything! Or Nastia, Aly and Jordin saying the same time ago. Vika is a sore loser because of her comment but when the british gymnasts and the american question the age of asian gymnasts they have just the right to do it??? I can’t deal with your hypocrisy guys ._. Doubledownie I mean, people definitely did criticize Riss and Sam a /lot/, and I didn’t hear about Lisa at all (though not totally surprised tbh) so that would be why not much was said about that. But yeah, Vika did get slightly disproportionately nailed to the wall on this one. I expect it’s because people assume Russians to have certain opinions about elegance, body type, etc that weren’t really in her post anywhere but if you assume they were it looks a lot worse…? Robbiecopter Really in the grand scheme of things everyone has said something stupid and it’s all how you respond to it in the long run, through future actions and how you learn from it. I agree vika was targeted a little more for this comment and it got out of hand. I love her and the US girls and have I said stupid stuff before? Of course. Did I react well to it? Not really. But as I move forward I recognize my faults and grow from them. But this is just me speaking with like… much less than thousands of followers so vika’s repercussions are much more severe especially since she is really the kingpin of Russian elegance at this time. I hope some people can find it in their hearts to forgive her. My-bff-nastia I’m basically crying because this is the cutest thing ever but also crying because of google translate. “I’m sorry. I’M ASHAMED OF YOU!!! Congratulations.” But seriously this is exactly why Vika didn’t deserve all of the hate she got. She is clearly going to great lengths to apologize and she fully said it in the heat of the moment, not because she believed it. Papaliukin Kudos to Vika for doing this. That’s something Valentina would never think of after all her outrageous statements that have circulated. Proganthony1978 And hopefully if anyone quotes this apology, then they will include that last line, showing that Vika used Google Translate and it made a very big mistake. So don’t pull the “I’m ashamed of you!” out of context. Italy's Erika Fasana, who qualified in seventh place on floor exercise in Glasgow, has withdrawn from the event's final. The reason behind her withdrawal is that she suffered an elbow injury, a stress fracture tibia, on vault during team final warm ups. As a result, she did not compete on uneven bars in the team final and only contributed on vault and floor exercise to Italy's 7th place finish. Shang Chunsong of China, who is the first reserve on the event, will replace the Italian gymnast. Fasana was the only Italian gymnast to qualify to an individual event final in Glasgow. Teammates Carlotta Ferlito and Tea Ugrin finished in 12th and 14th place respectively in the individual all around final. The balance beam and floor exercise final will be held next Sunday. Copyright © 2016-2017. WOGymnastika All Rights Reserved.